Salt- 1tsp or to taste. Mix all the given ingredients very well. Make 8 big lemon sized balls. Flatten each ball in your palms to get neat patties. Heat a pan with oil enough for shallow frying. Fry each flipping over sides to get golden brown patties. Alternately you can grill the patties in an oven like I have done here. Heat the oil and splutter mustard seeds.Then add the onion and saute until light brown. Add the ginger-garlic paste and fry until the raw smell is off. Now add the turmeric,redchilly,coriander powder and cumin powder.Fry for 2-3 mins. Then add 1 cup of water and salt,Once it is boiling throw in the greenpeas.Cover and simmer for 6-8 mins or until the peas are done. Finally add the garam masala, mix,adjust salt and simmer for a few more minutes to thicken the gravy. Place two patties in a plate.Pour the Ragda over it or on the sides.Pour 1 tablespoon each of hari chutney and meetti chautney and garnish with finely chopped onion,tomatoes,coriander leaves.Finally sprinkle some sev all over the dish. If available replace salt with black salt. You can adjust the gravy consistency of the Ragda to your preference.I like it with a semi-dry consistency.You can reduce the final simmering time to get a loose gravy if you would prefer to. 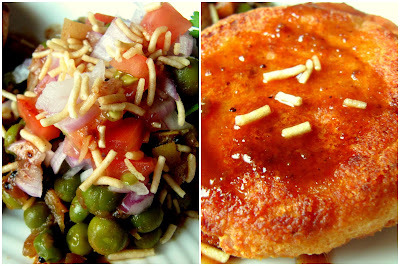 Recipe adapted with slight changes from Nita Mehta's Snacks & Chaat. Keep up the gud work..Plz peep into mine too..
OMG ! What an inviting dish it is... Thanks for visiting my space and Keep Visiting and Rocking !! !